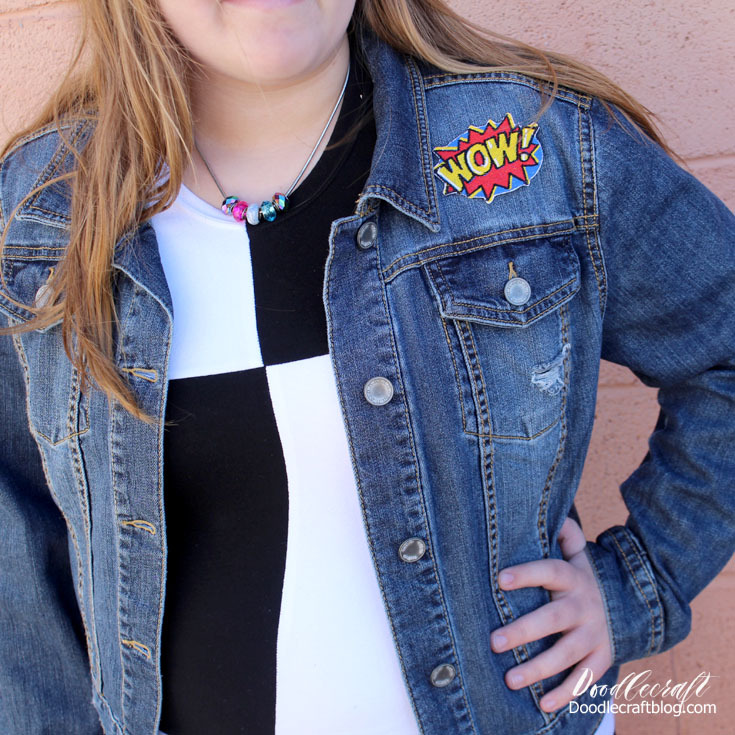 Doodlecraft: Bill Pott's Color Block Shirt and Wow Patch Jacket--Doctor Who Cosplay! Bill Pott's Color Block Shirt and Wow Patch Jacket--Doctor Who Cosplay! We've only seen a glimpse of the Doctor's new companion Bill. Her clothes are fun and trendy--this is the look I'm going for! Can't wait for Season 10 to start on April 15th! Denim jackets are all the style now--finished off with a slew of patches! My friend, Melarky, made this custom WOW! patch for me. Check out her Etsy Shop to get your own! Melarky , who turned it into a patch in no time! Comic Con or some other fun geek inspired night of fun! Let's start with a fun black and white color blocked shirt! I bought 2 shirts at the thrift store, both the same size, style and brand. I took the white one and stretched it out smoothly on the cutting mat. Used my ruler and centered it. Then cut it straight down the center. Rotary cutters make this a dream, scissors would be so hard to cut straight. Then divided in to thirds. leaving the center piece 11 inches. Repeat exactly for the other shirt. so there was a 1/2 inch I removed completely. Now it is just putting the right pieces together and sewing it back up. Starting with the armpit pieces. And continuing alternating colors and pieces. they will just be opposites! Place the right sides together and sew in place. Line up the 4 way intersection right in the centers. Flip right side out and ta-da! getting tired of 2 of your shirts! but we decided to just go with the shirt color-blocked. Next you'll need your WOW! patch and stitch it onto a denim jacket! Again, purchase your own Wow! Patch from Melarky on Etsy. I used thread and needle to tack the patch on since we are using it for cosplay. But make it permanent by ironing it on with a tea towel over top. so it is easy to cover with a light towel and iron gently...like I did on this She-Ra patch here. My denim is a bit dark, but works! My motto is Rock what you've got! Perfect cosplay look for Bill! Now you can fix up the hair however you like it! Add a necklace and maybe a bow and ta-da! It's an outfit to say Wow! about! More Doctor Who fun, cosplay and crafts here!